The Glazed Salmon with Wasabi Sabayon recipe comes from the Aquavit and the New Scandinavian Cuisine cookbook by Marcus Samuelsson. This recipe is more of a gourmet approach. Marcus Samuelsson with his Swedish background, creates many wonderful recipes by fusing it with Asian ingredients (in this recipe). He actually used Kecap Manis (Indonesian sweet and salty soy sauce) and Wasabi to enhance this recipe. The result is wonderful. 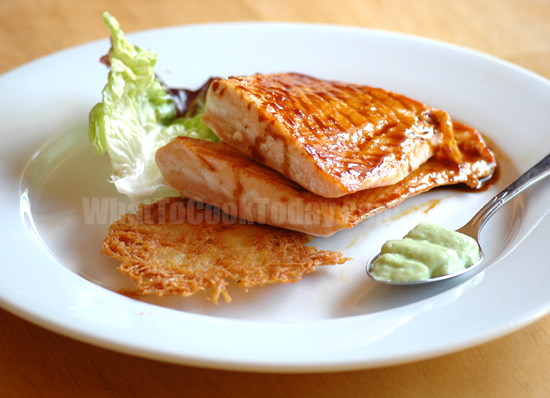 The salmon is then serve with Raggmunkar, a traditional Swedish Potato Pancake along with the Wasabi Sabayon. This recipe may not be necessarily everyday cooking, but I can see this being made for dinner date, your significant other’s birthday, anniversary etc.